Quarters 19 was built in 1890 by Staten Island contractor Henry Spruck. With the Island closed to the public until May, we’ll take a look at some of the history of Governors Island. Nolan Park is the gem of the Historic District. While Quarters 1, the 1843 Commanding Officer’s Quarters, gets most of the attention for its architectural flair, I’m drawn to the fifteen yellow homes. This is the former officer family housing, built between 1845 and 1902. It’s mind boggling to think how many military families lived in these homes going back to when President John Tyler was in office. Before we study Quarters 19, here is a walk through the history of this part of the island. Originally, the east side of Nolan Park, Quarters 1-9, was called General’s Row. The other side of the park, the western side with Quarters 13-20, was Colonel’s Row. I know all of the modern signage erected in recent years puts Colonel’s Row facing Liggett Hall (Building 400), and the little triangle park is now called Colonel’s Row Green. But every map and drawing of the island going back more than one hundred years says Colonel’s Row was on “The Green.” (I tried to help, but was told that the Coast Guard changed the name. The branch of the armed forces without colonels). These brick homes were called Regimental Row or Brick Row. Quarters 20, constructed in 1902, was the final yellow house built on Fort Columbus (before the name was changed back to Fort Jay in 1904) on Colonel’s Row. Quarters 20 has always been a favorite, ever since the first resident, General Frederick Dent Grant, son of President U.S. Grant, was the post commander. Postcards were made of it. However, next door to it is another charming house. Quarters 19 (GPS: N 40.689897, E -74.014371) was the penultimate home built on Nolan Park. The Army authorized it in 1890 and the contract was awarded to builder Henry Spruck of Stapleton, Staten Island. He built it for $11,165.00 (about $289,700 today). Work commenced on August 20, 1890, and was finished over Christmas. The two-story, six-bedroom home was designed for a senior officer and family. Like the others on the row it incorporates wood-frame construction in the Victorian Vernacular style constructed on Governors Island according to standardized Quartermaster General plans. Similar homes are on Army posts across the country. When the first family moved in sometime in 1891, it was a single-family house with a porch that wraps around the front. In the 1930s there was a housing shortage on the island and the home was remodeled and became a two-family house. One of the more interesting features is in the kitchen. 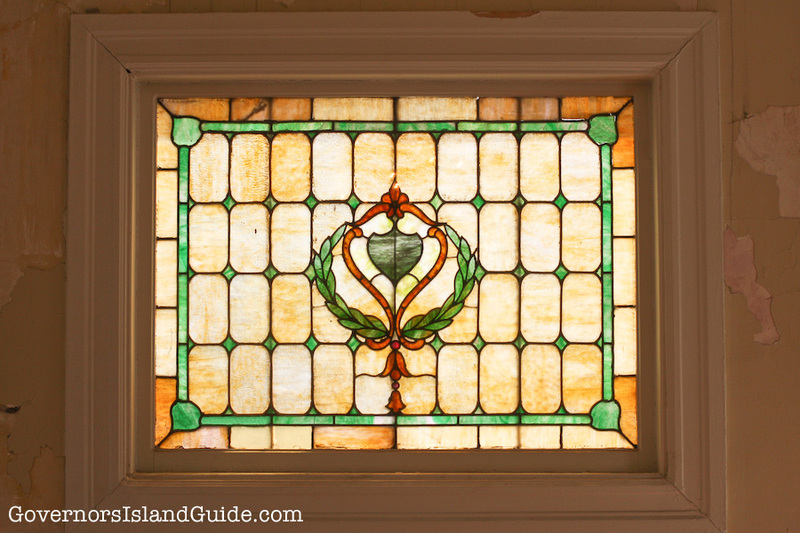 Quarters 19 is the only home on Governors Island with a stained-glass window. The Army did not issue this. It’s unknown whom the soldier was that loved this house so much that he had a beautiful custom-made window installed into what were really temporary quarters. The same year Henry Spruck built Quarters 19 on Governors Island he also completed another officers’ house at Fort Wadsworth, Quarters 112. The Quartermaster plans are the same and the homes look identical. Spruck was the builder of two other city landmarks. 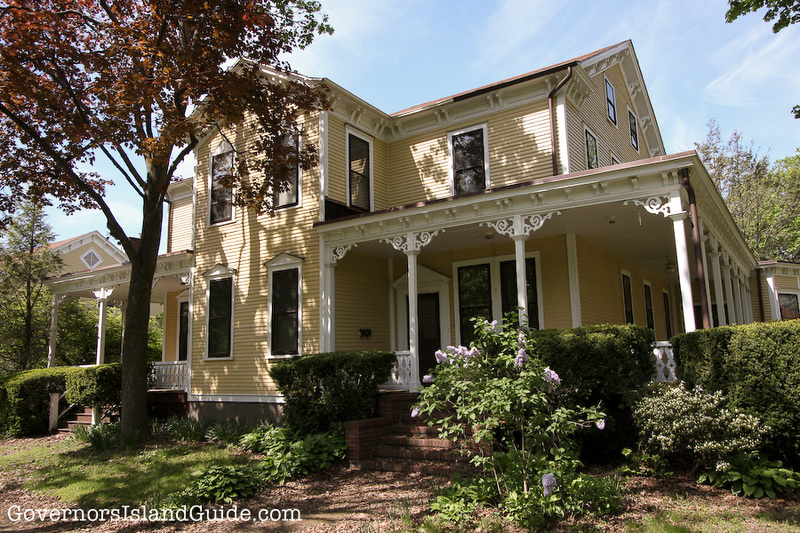 Both are on the same street in Stapleton, Staten Island: 387 St. Paul’s Avenue (1887), an eye-popping house in the Queen Anne-style for the daughter of beer baron George Bechtel, and the former P.S. 15 (1898), designed by Edward Alfred Sargent. Spruck also built the Louis A. and Laura Stirn House (1908), 79 Howard Avenue, given landmark status in 2001. In 2017 Quarters 19 will be one hundred twenty-seven years old. It is commonly used in the summertime by organizations such as the New-York Historical Society. The park is named for Major General Dennis E. Nolan (1872-1956). He was a veteran of the Spanish-American War, Philippine-American War, and World War I. His last command was at Fort Jay before he retired in 1936.